You're rocking your second round of the 26-pose sequence in hot yoga…and then you're not. The one-legged squat and twisted arms of eagle pose, or the out-flung leg and arm configuration of your glorious triangle pose suddenly defeats you, and you scramble to recover your balance on the sweat-slicked surface of your mat. You need a new mat. The right mat for sweaty yoga, hot or not, is an investment in your practice and your bodily integrity. You skid out of pandangusthasana (toe stand pose - you, balanced on the toes of one foot), and you'll be in corpse pose waaay before the end of class. Not good. But a yogi can drop some serious coin on a simple accessory that rolls up after class to sit in the corner. So, get a grip. Get a good mat. But fill your sahasrara, the top of your head, with the skinny on the best slip-free yoga mats out there to avoid a frustrating and expensive mistake. How Thick Are Yoga Mats? Non-skid, non-slip mats exist at every price point. However, the best ones are a little spendy. For your greatest return on investment, look for construction, material, thickness, moisture wicking or absorption, surface treatment (hi-tech), and cost versus frequency - is your yoga an addiction or a flirtation? Decide in advance whether your love affair with your mat will include maintenance - some of the good ones should be washed or wiped down and aired out after each use. Go green or go grippy - or maybe both, your choice with the right mat. Here are the eight mats of safer yoga, as defined by reviewers, research, and retail evidence to help you find you new best traction-action, home, away, and studio mat for solid lotuses and full locusts. Some names just pop up over and over again in the quest for a stick-to-it mat. These four each have a following -- and yogis are a tough crowd when it comes to mat loyalty. The Jade Harmony mat is a 3/16-inch, open-cell rubber, no-PVC mat that comes in luscious colors and two lengths: 68 and 72 inches. It's substantial, weighs about 5 lbs., and costs between $70 and $90 depending on where you buy it. Jade's fans are legion. 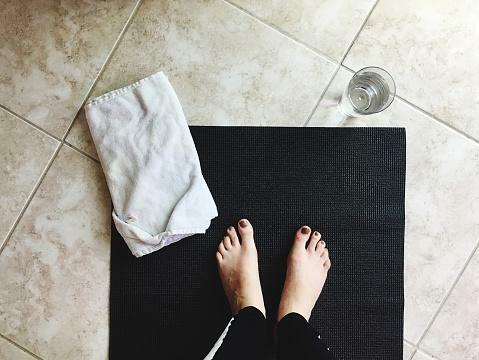 You can wash this mat with soap and water, and you'll want that sweat and studio bacteria gone before your next class, and the Jade Harmony has staying power. It also has a rubbery smell that takes a while to fade. However, it's a long-lasting investment that tops the charts for review sites like Consumer Search, Longevity Media, and Outside Online. The Jade Harmony is so eco-conscious that the company will donate a tree for every mat sold. Buy it on Jade Yoga for about $75. Just how good do you need to feel about your yoga practice? The iconic black Manduka Mat PRO for Yoga and Pilates is thick enough for comfort and latex-free enough for allergies. It's a long stretch of real estate; it comes in two lengths, up to 84 inches. That makes it heavy. The mat weighs about 7 pounds so this isn't a travel mat for your vacations or business trips. But Mandukas are made with closed-cell construction that repels moisture and cuts down on bacteria growth; you can wash it safely with mild soapy water and it won't feel sticky once it's dry, but it won't slip either. Win-win. The mats cost about $80, come with a lifetime guarantee, and are "zero-waste" with "emissions-free" manufacturing. Yoga Journal, VeryWell, and Outside Online are all fans. 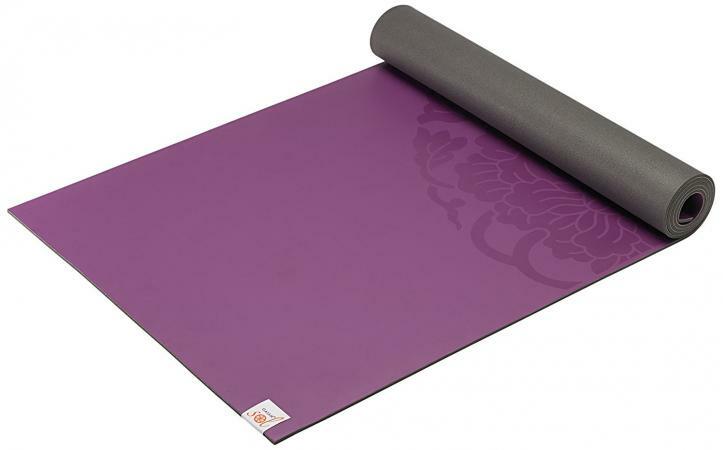 Sports Gear Lab names the Manduka PRO one of its "Best Non-Slip Yoga Mats." Maybe you will, too. Find it from about $80 on Amazon.com where it has a 4.4 out of 5-star customer rating. Gaiam is synonymous with yoga, and they have the best-selling mats to prove it. The Studio Select Dry-Grip targets a vigorous yoga practice with a special nod to those in heated rooms. Your power, ashtanga or hot yoga session will be a little more secure with a mat surface that wicks moisture and a 5 mm thickness, enough for good footing without scrimping on the padding. Consumer Search points out that some users complain the non-stick coating cracks after months of hard use, but that Gaiam fully guarantees the product. Dry-Grip mats are latex-free; they are made from PVC but, unlike many PVC mats don't contain the six phthalates that are banned from products for children. Health magazine online says it's "the best mat for yogis who sweat," and the surface "actually seems to get more grippy the sweatier you get." So Much Yoga ranks it among the "5 Best Yoga Mats for Sweaty Hands of 2017." The Studio Select Dry-Grip Yoga Mat comes in three colors with a delicate pattern on the surface and Gaiam sells it directly from their website -- on sale, the mat costs about $60. Most serious mats come with some form of lifetime guarantee, which softens the pain of the upfront cost a little. You can play around with bargain prices, but that usually ends with a short-lived PVC mat headed for the landfill and you, schlepping a sweat-absorbing towel to and from class. A bit skiddy and bad for focus; you and your practice deserve better. Liforme mats have great grip and are biodegradable. They sandwich a base of natural rubber, a center cushion of felt, and a high-tech polyurethane sticky topside (3/8-inches thick) - all sustainable and non-toxic materials. It's big (73 inches), comes in its own carry bag, weighs about 5.5 lbs., and costs about what you'd expect for top line quality, about $150. If you jet around to your yoga classes, you'll see Liforme mats in the UK as well; they have a devoted global clientele. The London Independent says it's "hard to find fault with" and "could be the ideal option," although it is investment-grade yoga gear, not for a tentative commitment. Verywell website lists Liforme among its top 5 Best Yoga Mats with "excellent practice surface, great traction and absorption, and a unique graphic that supports good alignment." You can buy it on Amazon.com, where it has a 4.7 out of 5-star customer rating. Aurorae Synergy 2-in-1 yoga mat was developed for hot yoga studios and the slick, sweaty, high humidity in those classes. It's a fusion mat with an integrated microfiber towel for non-slip focus on your poses. Use the towel side for wet classes and the PER (Polymer Environmental Resin) side for dry classes -- but expect its true "grippiness" to work best in damp-to-sloppy conditions. 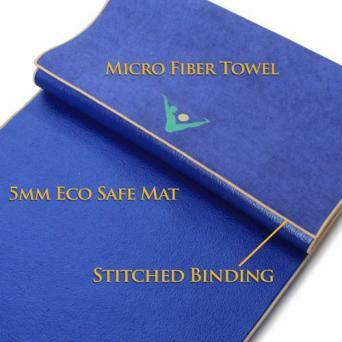 The mat, which is bonded and stitched securely together (foot-friendly "towel" layer on top), is 5mm thick, 72 inches long, and is latex-, silicone- and phthalate-free. It's lightweight and washable - you'll appreciate that as a hot yoga addict. Bargain alert! : Save some change when you pay about $60 for the Aurorae mat on Amazon, where it has a 4.7 out of 5-stars rating. The Yoloha Nomad will draw some attention in your yoga class, but it will not slip-'n-slide and neither will you. Cork is eco-friendly and anti-microbial, so it helps you to defeat the bacteria, mold, and odors that plague the owners of sweat-exposed yoga mats. A layer of closed-cell, latex-free foam backing further prevents the absorption of moisture and bacteria. The mat is lightweight (4.5 mm thick -- only 2.5 lbs.) but does heavy duty keeping you dry, and cork feels great underfoot. You can't use either side of this mat; the bottom layer is meant to grip the floor, not to be flipped topside for your sun salutations. However, the mat is a breeze to clean; just wipe it down with vinegar water, and you're good. Cork probably won't overtake rubber or high-tech mats any time soon but, for a retail price of about $100, customers who rated the mats on Amazon gave the Yoloha Nomad 4.7 out of 5 stars. YDL's Combo is another fusion mat that melds a "towel" top with a natural tree rubber base. The microfiber tops are made from recycled bottles, and the fabulous prints (choose from 12 not-your-average-yoga-mat designs) are showstoppers printed with water-based colors. It sticks to the floor and keeps you from wiping out in class, and then you can throw it in the washing machine when you get home but be sure to hang dry. The manufacturer recommends lightly misting the towel top before use if you aren't going to be sweating -- or, Yoga Mat Reviews suggests that you just flip it over and use the rubber mat side up. Longevity reviews says "[The Combo] provides the perfect foundation for Bikram." The Combo won't set you back too much. It sells for around $68 on Amazon, where purchasers have rated it 4.5 out of 5 stars. In the end, your best non-skid mat is a lot personal preference and a healthy serving of product development. You may be eco-conscious and avoid PVCs, budget-conscious and allergic to premium price tags, or tired of utilitarian gear and longing for a mat-sized stretch of beauty. You can find a non-skid mat to inspire you to new (sweaty) heights of sirsasana -- when you're upside-down you really don't want to be worried about slipping. You can find one made from sustainable cork or rubber -- or recycled surfer wetsuits. Your best bet is to suss out what people are hauling into hot yoga class week after week. If a mat won't work in there, you probably won't see it again.